OpenCV is an open source computer vision library originally developed by Intel. It is free for commercial and research use under a BSD license. The library is cross-platform, and runs on Mac OS X, Windows and Linux. It focuses mainly towards real-time image processing, as such, if it finds Intel's Integrated Performance Primitives on the system, it will use these commercial optimized routines to accelerate itself. 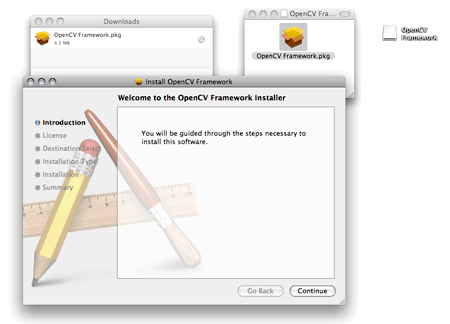 For Windows, download the OpenCV release version 1.0 (not the 1.1pre1) package and follow the instructions of the installer. 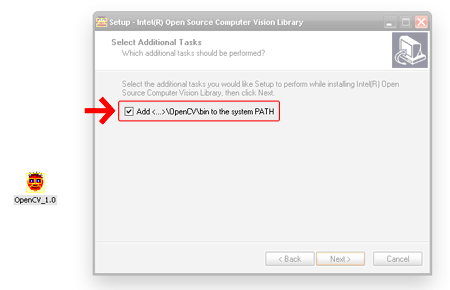 notes: be sure to select the additional tasks 'Add <...>\OpenCV\bin to system PATH' during installation (or you need to add the rigth path by yourself later) and reboot your machine. For Linux users, if your distribution doesn't propose packages in your favorite Package Manager tool, download the latest opencv-*.tar.gz archive and compile/install the source files as describe in the Linux install guide. 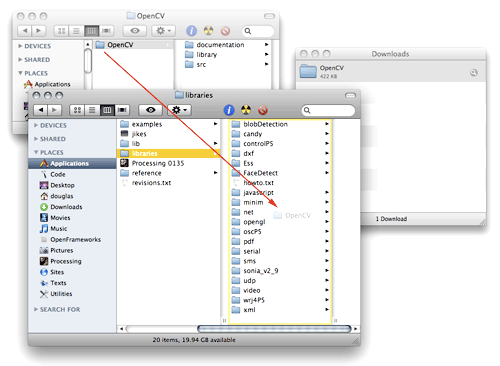 Download, unzip, and move the OpenCV Processing Library into your Processing libraries folder, or for Java users copy the content of the library folder in one of your Java Extensions folder. Optionally, you can download these OpenCV Processing examples or, for pure Java users, these OpenCV Java samples. The OpenCV Processing Library is a project of the Atelier hypermédia at the École Supérieure d'Art d'Aix-en-Provence. It is maintained by Stéphane Cousot and Douglas Edric Stanley. Special thanks to the openframeworks community for support and the C++ Binary Quicksort method.